Structured English has been applied as computational independent language for defining business vocabularies and business rules, e.g., in the context of OMG’s Semantics and Business Vocabulary Representation (SBVR). It allows non-technical domain experts to engineer knowledge in natural language, but with an underlying semi-formal semantics which eases the automation of machine transformation into formal knowledge representations and logic-based machine interpretation. We adapt this approach to the legal domain in order to support legal domain experts in their task to build legal vocabularies and legal rules in Structured English from legal texts. 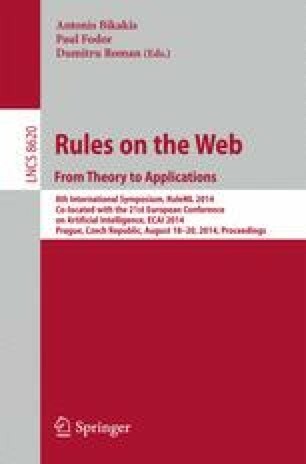 In this paper we contribute with a semi-automated vocabulary and rule development process which is supported by automated suggestions of legal concepts computed by a semantic legal text analysis. We implement a proof-of-concept in the KR4IPLaw tool, which enables legal domain experts to represent their knowledge in Structured English. We evaluate the proposed approach on the basis of use cases in the domain of IP and patent law.